This level has medium difficulty. 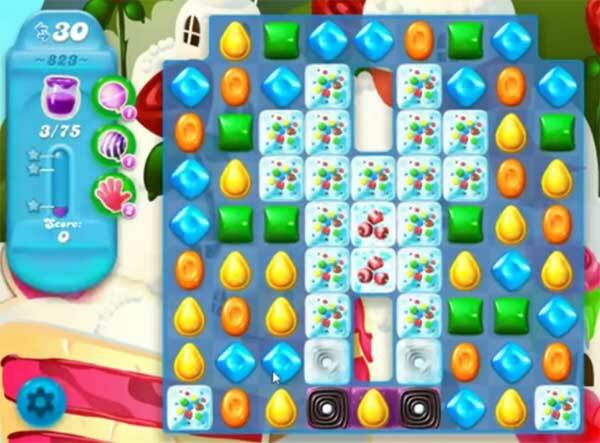 For this level try to play near to blockers or from bottom part of the board to shuffle the candies. Combine them with each other or play near to Jam to spread them to near candies. Not enough moves for this level..if you can play from the bottom, you might get some cascading going on and come close. And the tip for this level is useless, if you play near blockers, you use almost all your moves trying to clear those, and no moves left for spreading jam. Also, a striped will not pass the jam through the blockers, even if there isn’t a licorice in the way,,,just an fyi!! Thanks for the input. I only come on here for the comments. The so-called advice is ridiculous. it’s a hard one, finally got it on about the 15th try, get your jam started as soon as you can and then play as close to the blockers as you can, from the bottom up!